This is Jackie. 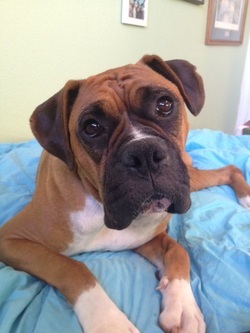 A loving, petite (about 50 lbs), beautiful 2 yr. old boxer girl. She was taken from a home because her previous owner didn’t understand how to fulfill dogs basic needs. She came to the shelter with only one puppy, we aren’t sure what happened to the others in the litter. She has been a momma to more than one litter but we aren’t sure how many litters she has had. She gets along with most male and female dogs it just takes some time for her to become comfortable with them. She doesn’t like to be introduced to other dogs on the leash. She prefers to meet friends in an open area with no tension. She reacts very well to your tone of voice. We are working on commands such as sit and down. She is a quick learner however she can be nervous because all she wants is to please you. So far she has shown preference in women than men. When living with a man for one week it only took her 2 days to know he was trustworthy and soon she came up to his side wanting love. She doesn’t like to go potty in the house. Instead she likes to roam in the back yard until she finds her perfect spot. She likes walks and toys! She doesn’t like to share bones, but who can blame her. She will be your shadow. She likes it when the family is all together. She does well in the car and will jump in if you want to take her with you, all she asks is that you turn the AC on for her if it is a warm day. Jackie likes to sleep with you but if you want to crate her, it will take a little extra push because she doesn’t like being left without a human friend. She is up to date on her shots and is spayed.